If you have ever received a vaccination, you know your arm may feel a bit sore for a few days after the fact. The pain you are experiencing is usually soreness of the muscle where the injection was given. This pain is also a sign that your immune system is making antibodies in response to the viruses in the vaccine. It is likely the combination vaccines, like diphtheria, tetanus, whooping cough (DTaP), that cause greater local reaction and the “pain” you experience with the vaccine. Can You Reduce Pain or Swelling After Vaccines? Make sure to move your arm around after the vaccine. If you try to keep too still, it may hurt more. Take a pain reliever for one or two days after receiving vaccination to help with soreness and swelling. If you’re concerned about the redness and swelling, outline the area with a marker. If it increases in size or does not decrease after a few days, call your doctor. RELATED: Why Should I Get A Flu Shot? When Should I Seek Help for Injection-Site Pain? Signs of an allergic reaction, which can include difficulty breathing, hoarseness or wheezing, hives, paleness, weakness, a fast heartbeat, or dizziness. 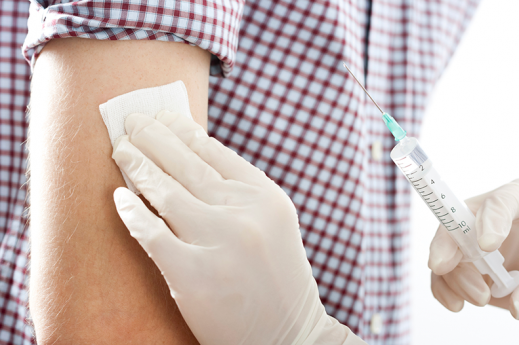 Concerned about pain, swelling, or soreness after your vaccine? Find a UPMC Urgent Care location near you.